Burrito Blog: Como Se Dice...Huevos Blancos? After an evening out, Paul, Kristin, and I headed down the hill to Benitos for some late night snacks. Kristin and I skated, and Paul has some real hustle. Kristin was craving a huevos burrito filled only with egg whites. After a brief lapse in communication with the cashier, she found the lingo: huevos blancos. 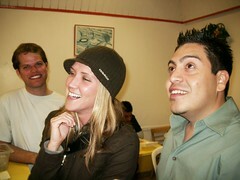 That accent was all our new friend (at right) needed to hear before embarrassing Kristin and her Español skills. She got the egg whites, and we all got a good laugh. Wednesday, March 08, 2006 by Jonah.